“RADLEY”, a “Schools” class engine of the Southern Railway, at the head of a Portsmouth and Isle of Wight express at Waterloo Station. The well-known “Schools” class locomotives work all the principal Waterloo-Portsmouth trains. The best expresses cover the 74½ miles between Waterloo and Portsmouth in just over 1½ hours. of construction gauges, and the cross-sectional limits to which locomotives may be built are thereby restricted. But perhaps the most important factor is that of coal. Some of the finest steam coal in the world is mined in Great Britain, and full utilization of the heat units developed in its combustion may be obtained in fireboxes of relatively small dimensions. Not only so, but the cheapness of fuel in Great Britain has tended, in earlier years, to arrest locomotive development. At the beginning of the present century it had become the common practice to build nothing but 4-4-0 locomotives for express passenger service, having cylinders of relatively large dimensions - about 19-in diameter by 26-in stroke - allied with a small boiler and firebox, the whole engine weighing only from 50 to 60 tons at most. Perhaps the extreme expression of this principle in design was found in the “Precursor” type 4-4-0 engines of the late London and North Western Railway, built to the designs of Mr. George Whale in 1904. Mr. Whale’s predecessor, Mr. F. W. Webb, had flooded the LNWR with compound engines of inadequate power and uncertain performance, as the Webb system of compounding employed had certain serious defects. In 1904, therefore, a straightforward design of simple 4-4-0 was prepared, in “Precursors”, to take the place of the compounds, and to do away with the double-heading of trains which was rife under the Webb regime. work in their day. The writer’s most outstanding experience, probably, was with the engine “Wild Duck”, which, after stalling on greasy rails on the ascent of Camden bank, out of Euston, recovered over thirteen minutes between Willesden and Crewe, with a train of twelve coaches, weighing 410 tons. This locomotive covered the 150.6 miles from Willesden to mile-post 156, inclusive of the slacks through both Rugby and Stafford, at an average speed of 62.1 miles an hour. When the twentieth century opened, therefore, the 4-4-0 reigned almost supreme on express passenger service in Great Britain, with some help from “single-driver” designs, such as the famous Stirling “eight-footers” on the Great Northern Railway. “OTTERHOUND”, a 4-4-0 locomotive of the “George the Fifth” class, built in 1910 by the London and North Western Railway, now part of the LMS. This class of engine was, in its time, one of the most successful in Great Britain. The leading dimensions are: cylinders 20½-in by 26-in, diameter of driving wheels 6 ft 9-in, total heating surface 1,763 sq ft, grate area 22.4 sq ft, boiler pressure 175 lb, and weight of engine alone 59.8 tons. 5 ft 6-in. Full advantage was taken of the “Atlantic” wheel arrangement by spreading the firebox right across the frames to the extreme width of the engine. Such generosity of steam supply as was represented in 2,500 sq ft of heating surface and 31 sq ft of grate, in association with such small cylinders, was unprecedented in Great Britain at that date. But the wisdom of Ivatt has been fully justified by the results. Probably there are no other locomotives which have seen such consistent success through more than three decades of history as the Ivatt “Atlantics”; especially since the addition of superheating equipment from 1910 onwards. sufficient steam to the cylinders without the engine having to be “thrashed”, by the use of wastefully long cut-offs. Churchward’s aim was that the expansive properties of the steam should be used to the utmost, as thermal efficiency is obviously increased if the same weight of steam can be made to do more work than before. In the years 1904 and 1905 the Great Western Railway purchased three compound “Atlantic” locomotives from France, modelled generally on the lines that had proved so successful on the French Northern Railway. While the Great Western did not follow, in its new designs, the two stages of expansion embodied in these compounds, the valve-motion was re-designed in such a way as would permit a range of expansion almost equally great in simple cylinders - two cylinders in the earlier designs, and four cylinders in the later. express engines of other lines. were all, at a later date, converted to the 4-6-0 type. Since then, with the one exception of “The Great Bear”, to which further reference will be made in a moment, all Great Western engines built for heavy express passenger service have been of the 4-6-0 wheel arrangement. Another feature of the “Saints” was the unusual length of stroke - 30-in - that the designer adopted, coupled with a diameter of only 18-in, but this also was devised with a view to increasing the range of expansion in the cylinders. subsequent series were built, such as the “Monarchs”, “Queens”, “Princes”, “Princesses”, “Knights”, and “Abbeys”, all coming within the “Star” class, but with slight differences in dimensions. THE FIRST “ATLANTIC” express engine in Great Britain was introduced by H. A. Ivatt on the Great Northern Railway in 1898. The cylinders measured 18¾-in by 24-in, and the driving wheels 6 ft 7½-in; total heating surface was 1,442 sq ft, grate area 26.7 sq ft, and boiler pressure 175 lb. These engines - one of which is shown above - were the forerunners of the large-boilered “Atlantic” type shown below. Mr. C. B. Collett then succeeded Mr. Churchward, and the year 1923 saw the first “Castle” class four-cylinder 4-6-0 emerge from Swindon Works. For all-round success this is the most remarkable type of locomotive that the Great Western Railway has ever built, and it is no small tribute to “Castle” efficiency that engines of this type are still being turned out at Swindon, even though thirty of the still larger “King” class 4-6-0’s have been at work since 1927. The most outstanding success of the “Castles” was achieved, however, not on Great Western metals at all, but on those of the LNER and LMS Railways, when engines were exchanged for trial purposes with those of the latter companies. At various previous periods of British locomotive history engines had been “exchanged”. In 1909, for example, the LNWR exchanged a 4-4-0 “Precursor” named “Marquis” for a Great Northern “Atlantic” No. 1449; and in 1910 the LNWR exchanged a 4-6-0 “Experiment” for a Great Western “Star”. In these exchanges the “visitor”, in each instance, with its own driver and fireman on the footplate, was rostered to work fast and heavy trains of the railway to which it had been temporarily transferred, so that comparisons of speed and coal consumption might be made with those of the engines normally used on the same services. “Polar Star” of the Great Western created somewhat of a sensation in 1910 on LNWR metals by the ease and low coal consumption with which she undertook the duties assigned to her. But the LNWR engine “Worcestershire” - which, it is only fair to add, had considerably the smaller dimensions of the two - found the Great Western schedules altogether too onerous, and lost a good deal of time. The upshot on the LNWR was the building in 1913 of the first four-cylinder 4-6-0 engines of the “Claughton” class. 111 and called “The Great Bear”. But this was the least successful of all Mr. Churchward’s designs. Because of the constant reverse curvature of the West of England main line beyond Reading, No. 111 was not found suitable for the workings to Exeter and beyond, and throughout its existence as a 4-6-2 was practically confined to the 118½ miles between Padd-ington and Bristol. IVATT’S LARGE-BOILERED “ATLANTIC” of 1902 represented a turning point in British locomotive history. These engines are still responsible for many important duties,such as the “Queen of Scots” Pullman express, shown here, non-stop between King’s Cross and Leeds. But the new Gresley 4-6-2 of 1922 was destined to become the forerunner of a class of one of the most famous and capable express locomotives in the country. With three cylinders 20-in in diameter and 26-in stroke, a boiler of enormous size, and a firegrate affording no less than 41¼ sq ft of area, No. 1470, “Great Northern”, now No. 4470, was indeed a revolutionary machine. But still the designer adhered to a working pressure no greater than 180 lb per sq in, and to a valve-setting which called for cut-offs unchanged at 30 to 40 per cent or so. powerful express engine in Great Britain”. The claim was based on the tractive force formula, which, with the considerable help of 225 lb per sq in pressure in place of 180 lb, gave the GWR locomotive such an advantage that her calculated tractive effort was certainly slightly greater than that of the bigger and heavier LNER engine. “Pacific” No. 4474, “Victor Wild”, was handed over to the Great Western Railway authorities for a fortnight, and “Castle” class 4-6-0 No. 4079, “Pendennis Castle”, was received in exchange. The “Pacific”, with the LNER driver Pibworth on the footplate, ran between Paddington and Plymouth in competition with the Great Western No. 4074, “Caldicot Castle”; and “Pendennis Castle”, with the GWR driver Young on the footplate, ran between King’s Cross and Doncaster in competition with “Pacific” No. 4475, “Flying Fox”. It was one of the most exciting events in British railway history. Crowds lined the tracks to see the strangers fly by, and the public interest in this sporting contest was great. The result of the trials was to prove up to the hilt the economic soundness of the principles underlying the Great Western design. Both engines succeeded in doing each other’s work without difficulty. The driver of the LNER “Pacific” on Great Western metals probably had the harder task. “BUCKINGHAMSHIRE”, one of the “Shire” class three-cylinder 4-4-0 express locomotives introduced on the LNER in 1927. The leading dimensions are: cylinders (three) 17-in by 26-in; coupled wheels 6 ft 8-in; length of engine and tender 58 ft 8¾-in; total heating surface 1,669.5 sq ft; boiler pressure 180 lb per sq in; and grate area q ft.
4-6-0’s of the LMS, between Euston and Carlisle, was even more strikingly in favour of Great Western constructional methods. The result has been that from that time forward Great Western principles of valve-setting, with longer valve-travels, have become general, as well as higher working pressures. 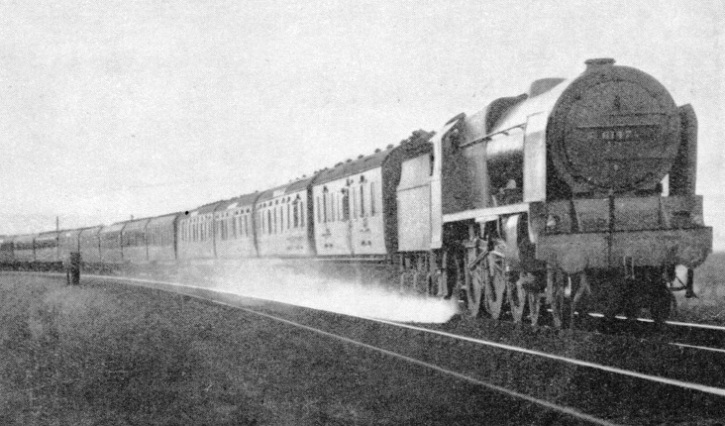 After the Great Western-LNER locomotive exchange, the valve-travel of all the LNER “Pacifics” was lengthened, and a new series of “Super-Pacifies” was put in hand in 1928, with working pressure raised from 180 to 220 lb per sq in. A SCOTTISH EXPRESS descending from Shap Summit, Westmorland, on the way to Scotland. The train is hauled by one of the LMS “Royal Scot” class locomotives. There are over seventy of these powerful engines, but they are among the relatively few locomotives in Great Britain with a boiler pressure as high as 250 lb. The LMS Railway turned out in 1927 the first of the 4-6-0 “Royal Scots”, with a working pressure of 250 lb per sq in, though no higher pressure than 200 lb had been used on that railway previously. The Southern Railway, which by now had fitted the “King Arthur” 4-6-0’s with lengthened valve-travel, brought out in 1926 the bigger four-cylinder “Lord Nelson” 4-6-0’s, raising the pres-sure from 200 to 220 lb per sq in. Finally, the Great Western “Kings”, biggest and most powerful of all British 4-6-0’s, appeared in 1927. Another locomotive exchange, of earlier date, had an equally widespread effect on British locomotive practice. Brighton and Rugby in one direction each day, while the LNWR worked the train in the opposite direction. consumption of coal and water - so much so, indeed, that no difficulty was experienced in making the non-stop run of 77.2 miles between Willesden Junction and Rugby, at an average speed of over 50 miles an hour, on a tank capacity of only 2,200 gallons. The Brighton engine had no apparatus for picking up water from the track-troughs, and so replenishing the tanks, whereas the North Western engine, with a tender holding 3,000 gallons, had two opportunities on this run. “SIR FRANK REE”, one of the “Baby Scot” class 4-6-0 engines in operation on the LMS. The leading dimensions are: three cylinders 18-in by 26-in, driving wheels 6 ft 9-in, working pressure 200 lb, tractive effort 26,520 lb, and total weight, with tender, 123½ tons. The immediate outcome of this exchange was the building in 1910 of, the superheated version of the London and North Western “Precursors” - the successful “George the Fifth” 4-4-0 type. But the ultimate result of this demonstration of Brighton efficiency was the introduction of locomotive superheaters on every British railway. increase in the strength of the boiler shell and the steam passages, and tends also to add to the costs of maintenance. Superheating is universal, except for shunting engines, and allows of a greater range of expansion of the steam without loss of efficiency by condensation. Other changes have been the widespread introduction of three-cylinder and four-cylinder in place of two-cylinder designs. This has partly been due to the impossibility of disposing two cylinders of adequate size in the limited space available between the frames, or, alternatively, outside the frames, so that the required cylinder volume has been split up into three or four parts. But these multi-cylinder arrangements have another and most important outcome. The “balancing” of the heavy moving parts of the engine is so improved that the “hammer-blow” effect on the track is almost eliminated; thus it has been possible to add without risk to the weight imposed on locomotive driving wheels for adhesion purposes. “PRINCESS MARGARET ROSE”, a 4-6-2 express locomotive built for the LMS in 1935. The engine has four single expansion cylinders measuring 16¼-in by 28-in, and the driving wheels have a diameter of 6 ft 6-in. The boiler pressure is 250 lb per sq in, and the total hearing surface, including superheater, is 2,967 sq ft. The grate area is 45 sq ft, and the engine alone in working order weighs 104 tons 10 cwt. “Super-Pacifics” carry 66¼ tons on their three pairs of coupled wheels, and the Great Western “Kings” 67½ tons, the former with three cylinders and the latter with four. In the same period from 1910 to 1935 valve-motions have changed generally from the Stephenson or Joy types, which were generally standard in the former year, to the Walschaerts, which permits of a better steam distribution. Other alter-ations have been the gradual introduction of taper boilers, in which the barrel increases in diameter towards the firebox end, thus giving the maximum space for the collection of steam at the end of the boiler which is the hottest. This was a feature first introduced on the Great Western Railway, and now adopted on all new designs of the LMS Railway. On the LNER, taper boilers are confined to the “Pacifies”; on the Southern there is a very slight taper in the boilers of the “King Arthur” 4-6-0’s. leading dimensions of all the various express locomotive types which are now regarded as standard in Great Britain. “SIR MENADEUKE”, a “King Arthur” class locomotive on the Southern Railway. These engines have cylinders 20½-in by 28-in, and driving wheels 6 ft 7-in diameter. Total heating surface is 2,213 sq ft, grate area 30 sq ft, and working pressure 200 lb. The weight of engine and tender is 138½ tons. exceeding 650 tons have been hauled on normal schedules by the “Pacifics” without assistance. To a “Pacific” also are due the honours of the London-Newcastle-London runs of March 5, 1935, when a total of 300 miles was covered at an average speed of eighty miles an hour and a maximum speed of 108 miles an hour was attained. The high-pressure series of LNER “Pacifics”, with boilers pressed to 220 instead of 180 lb per sq. in, can be easily distinguished by the casings bolted on to the smoke-box sides, immediately below the chimney, which house the two ends of the superheater header. Mr. Gresley is a believer in a high degree of superheat, and the high-pressure “Pacifics” have super-heaters of 43 elements, i.e. 43 large flue-tubes, each housing one of the small looped steam-tubes in which the temperature of the steam is greatly raised on its journey from the superheater header (in the smoke box) to the firebox and back on its way from the boiler to the cylinders. In the high-pressure “Pacifics” the diameter of the cylinders is reduced from 20 to 19-in. Edinburgh and Aberdeen, is fully dealt with in the chapter beginning on page 400, and no further reference is here necessary. 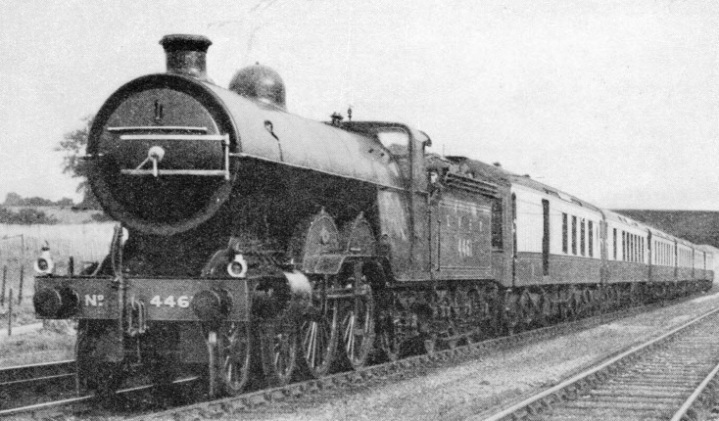 For intermediate express passenger work on the LNER two other standard types have been built, both with three-cylinder propulsion - the 4-6-0 “Sandringham” class, chiefly for service on the Great Eastern Section, but now being introduced on the Great Central Section as well, and the 4-4-0 “Shire” class, with its later “Hunt” class development. The “Hunts” differ from the “Shires” in that Lentz poppet-valves, instead of piston-valves, are used, operated in a number of the engines by rotary cam gear instead of Walschaerts motion. THREE-CYLINDER EXPRESS LOCOMOTIVE designed by H. N. Gresley for use on the Great Eastern Section of the LNER. The three high-pressure cylinders measure 17½–in 26-in, the coupled wheels have a diameter of 6 ft 8-in, the total heating surface, including superheater, is 2020 sq ft, and the grate area is 27.5 sq ft. The boiler pressure is 200 lb per sq in, and the tractive effort is 25,380 lb. The above engine was named “Sandringham” by the special permission of HM the King. Great Britain) and the North British “Atlantics”. Great Britain to share so high a working pressure as 250 lb per sq in, although this is now a fairly common figure abroad. These engines appeared during the reign of Sir Henry Fowler as Chief Mechanical Engineer of the LMS in the earliest years of that group, when increased locomotive power was once again urgently necessary to reduce the double-heading of trains which again had become rife. the road in Mr. S. W. Johnson’s day, and later improved by Mr. R. M. Deeley. To-day some 235 engines of the last-mentioned type are at work over nearly all parts of the LMS system. “Baby Scots” were brand-new engines. For performance in relation to size and dimensions no engines on the LMS have done better work than these, for they have shown a tractive capacity but little inferior to that of the “Royal Scots”. Then came the advent of Mr. W. A. Stanier to the LMS as Chief Mechanical Engineer in 1932. Before this he had been second-in-command at Swindon Works, and he brought many Great Western specialities with him, such as taper hailers, top-feed, steam collection in the top of the firebox instead of in a steam-dome, and the low degree of superheat which the GWR has always favoured, in comparison with the high superheat of other railways. 4-4-0 COMPOUND EXPRESS ENGINE, designed by R. M. Deeley for the Midland Railway. Deeley designed forty of this type, which was a modification of the 4-4-0 compounds built by his predecessor, S. W. Johnson. Johnson’s compounds had cylinders 19-in by 26-in and 21-in by 26-in, and 7 ft driving wheels. Deeley’s compounds had almost the same dimensions, except that the boiler pressure was increased from 195 lb to 220 lb. Later Midland compounds built by the LMS have 6 ft 9-in driving wheels and a boiler pressure of 200 lbs. The principle underlying low super-heat is that no more superheat shall be applied to the steam than is necessary to prevent condensation - that is to say, that none of the superheat applied shall be thrown to waste out of the chimney. But what has proved successful on the GWR with Welsh steam coal has proved less successful on the LMS, and the types built during the Stanier regime are in general having their super-heaters enlarged. pressure of 250 lb per sq in. Two years of trials were conducted with the first two engines before the next ten were put in hand. The other Stanier type for express passenger work is the “5XP” - “5X” for its power classification, midway between Classes 5 and 6, and “P” for “Passenger”. These engines, of which large numbers have been and are still being built, chiefly for the Western and Midland Division working and in Scotland between Carlisle and Glasgow, are often confused with the “Baby Scots”, but differ widely from them, although both are classed as “5XP”. The Stanier engines can most easily be distinguished from the “Baby Scots” proper by a taper boiler in place of the parallel boilers of the latter type. Both have three cylinders, but the Stanier engines carry a 225 lb steam pressure instead of 200 lb, and rather smaller cylinders, so that the tractive efforts of both types are roughly equal. “Stars”, “Castles”, and “Kings” - have already been mentioned. in most points they closely resemble one another, save for gradual increases in the size of cylinders and boilers. Domeless boilers are a standard feature of Great Western equipment. Another is very large cylinder ports, which explain the sudden and almost explosive exhaust of Great Western engines, and, by the freedom with which they allow the steam to escape from the cylinders, do much to account for the traditional freedom of running of Great Western locomotives at speed. A third feature is lengthy valve-travel. The “Castles” are probably the speediest engines on the GWR, and are still being multiplied; the “Kings” are the heavy-duty main line engines, used exclusively between Paddington and Plyrnouth - via Westbury or Bristol - and Paddington and Wolverhampton. The “Kings”, weighing 89 tons without tender, are the heaviest 4-6-0 locomotives in Great Britain, and thirty of them have been built. “SILVER JUBILEE”, built in 1935. This LMS 4-6-0 engine is one of the Stanier “5XP” class. It has three cylinders 17-in by 26-in, driving wheels of 6 ft 9-in, a grate area of 29½ sq ft, and a working pressure of 225 lb per sq in. It has chromium-plated fittings and a glossy black finish. 1 in 80, and flying down the ensuing descents, all within the compass of start to-stop bookings timed at up to fifty-five miles an hour average. Their larger development is the “Lord Nelson” type, with four cylinders in place of two, and 220 lb working pressure in place of 200 lb. “Lord Nelsons”, it is surprising to find that the latter weigh only 2½ tons apiece more than the former - 83½ tons as against 81 tons, without tenders, of course. The final express locomotive type to be mentioned on the Southern Railway is that which has been named after famous schools. For their size and weight the “Schools” are notable engines. By careful design and the use of three cylinders, Mr. R. E. L. Maunsell has produced a 4-4-0 locomotive with practically the same power output as the 4-6-0 “King Arthurs”. on which hilly lines they are responsible for the major part of the work. “PAPYRUS”, a LNER “Pacific” 4-6-2 three-cylinder express engine at speed. This famous engine covered 536.6 miles at an average of over 70 miles an hour, and achieved a maximum of 108 miles an hour when of a test run between London and Newcastle and back in March 1935. Of the round trip, 300 miles were covered at an average speed of 80 miles an hour. The special train weighed 217 tons. 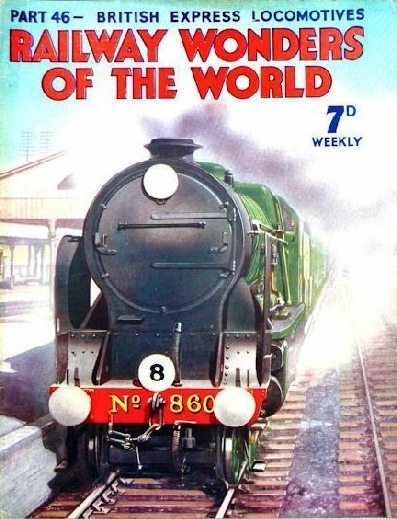 You can read more on “108 mph on the LNER”, “The Silver Jubilee” and “Speed Trains of Britain” on this website.